You have surely seen the demonstrations by the CEOs and staff of Silicon Valley (oh so cool Wall Street based) companies such as Google, Twitter, Facebook, etc. about the Trump Travel Ban on 7 Muslim Countries. And they should be commended for speaking out about such an un-American, anti-Freedom and Stupid order of Trump. But as horrible and stupid as Trump Travel Ban order was, it affected maybe about 0.1% of visitors to USA and certainly none of these People were Killed due to this Travel Ban of Trump. Meanwhile the same time in USA, due to USA lacking something as basic and essential as Government run Universal Socialized Healthcare (NHS), 50,000 Americans are Killed Per Year due to No Healthcare, 2-Million Americans go bankrupt per Year due to Healthcare costs , etc. misery, because Wall Street based powers behind Republicans, Democrats and Media outlets such as CNN, MSNBC, Fox AND Google, Twitter, Facebook, etc. have lied and lied, have spend 10s of Billions of Dollars, to prevent the establishment of something as essential as Universal Socialized Healthcare. So that the Wall Street Billionaire class can make an extra Trillion Dollars from Healthcare in USA, damn be how many American People this will Kill or Bankrupt - Per YEAR. 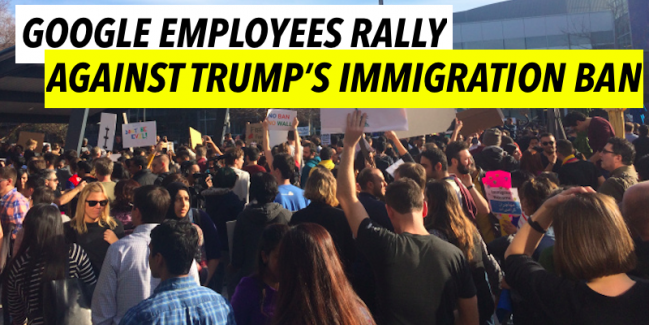 So where are the demonstrations by these Silicon Valley (oh so cool Wall Street based) companies such as Google, Twitter, Facebook, etc. over the State of Healthcare in USA where 100-Million Plus Americans have NO Healthcare, or affordable Healthcare! Because USA lacks the most basic of Social Services, which is Government run Universal Socialized Healthcare (NHS), something so basic and essential that 100% of all developed Nations, that is all European Nations, Canada, Australia, Japan, including Israel the beloved Nation of Republicans, Obama/Clinton Democrats & the right-wing Media have had for many Decades. Which lack of NHS in USA, unlike the Trump Travel Ban which did not Kill anyone, is actually Killing at least 50,000 Americans Per Year due to No Healthcare. Which NHS is so good and essential for the well being of a Nation, that 100% of all Conservative parties in Europe, Canada, Australia, Israel, etc. 100% support their NHS. Because NHS beside giving Healthcare to all the People of the Country for the Taxes People pay, also means spending 50% less, not more, but 50% less, on Healthcare compared to US style for-profit Wall Street based Healthcare. Where were the demonstrations by these Silicon Valley (oh so cool Wall Street based) companies such as Google, Twitter, Facebook, etc. when Obama Admin came and passed a Healthcare plan that made the most minimal improvements in the State of Healthcare in USA, because Obama Admin passed a Healthcare plan proposed by the Ultra Right-Wing of the Republican party (aka Heritage Foundation), a plan that became RomneyCare, but it is not even as Socialized as RomneyCare! A plan that is the EXACT OPPOSITE of NHS! As a result of which joke of Healthcare plan that Obama Admin passed, and having no shame they named it Affordable Care Act (ACA ) and Republicans and right-wing Media having even less of a shame called it ObamaCare and opposed it, 10s of Millions of Americans continued to have NO Healthcare  and a few Millions that supposedly got Health Insurance via ACA found it to be an un-affordable (Wall Street) rip-off , which you can see by the fact that typical ObamaCare Health insurance plan, for someone making a modest $2000 per Month, means the following rip-off: exorbitant $700 per Person monthly premium (under so called Gold Plan), $7,000 per Year per person Deductibles, 20% Co-pay, etc. un-affordable rip-offs. Where were the demonstrations by these Silicon Valley (oh so cool Wall Street based) companies such as Google, Twitter, Facebook, etc. when Romney promised to repeal ObamaCare (aka RomneyCare light), so as to ensure that even more Americans do not have Healthcare? So that even more Americans would be Killed due to NO Healthcare! Even though ObamaCare is a Joke of a Healthcare because it is a watered down version of Healthcare plan Romney passed based on a plan proposed by the Ultra Right-Wing Heritage Foundation! Or where are the demonstrations by these Silicon Valley (oh so cool Wall Street based) companies such as Google, Twitter, Facebook, etc. when Trump and current Republicans who have (astonishingly and defying any logic) taken control of US Congress and Presidency are promising that they will repeal ObamaCare (aka RomneyCare light), so as to ensure Maximum number of Americans do not have Healthcare? So as to ensure that even more Americans are Killed due to NO Healthcare! Again, even though ObamaCare is a Joke of a Healthcare plan, that is it has made the most minimal improvement in the state of Healthcare for American People, because it is a watered down version of Healthcare plan proposed by the Ultra Right-Wing of the Republican Party! "Repealing Obamacare could kill more people each year than gun homicides"
So if you are in Germany, Denmark, France, Canada, Australia, etc. developed Nations keep in mind what Google, Twitter, Facebook, etc. really are. They are the Internet based Media arms of the same Wall Street right-wing lying Machinery that has even lied and lied about Healthcare for American People, resulting in USA lacking something as basic and essential as Universal Socialized Healthcare, that you all have had for many Decades, as a result of which at least 50,000 Americans are KILLED per Year due to No Healthcare. And of course this Wall Street right-wing lying Machinery has lied about many other wrongs, such as the reasons for Wars, which is why USA has been engaged in War after War after War after War, from Vietnam to Iraq, while your Nations are not. Do you really want to use such Media outlets? If you do, do so at your own peril. Or at least call Google, Twitter, Facebook, etc. for their Hypocrisy of, rightly so, demonstrating against the Trump Travel Ban while being silent about the State of Healthcare in USA and other atrocities put into place by their Wall Street bosses. WOW WOW. This is some Strong Mind blowing stuff man. What is amazing to me is why more People are not active on this Site or know about it! Because they are Brain Washed by Wall Street right-wing Media to not know better. Also Wall Street based Media arms of Google, Yahoo, Hotmail, etc. are censoring realnewspost.org emails to be delivered to People who have Subscribed to realnewspost.org. Because they are so afraid of simple Truth. True, its the corporate "what's in it for me" mentality and they expect us to fall for it when its dressed as "we need more talent" but not decent healthcare. Yes, I agree with this article and your assessment fully. 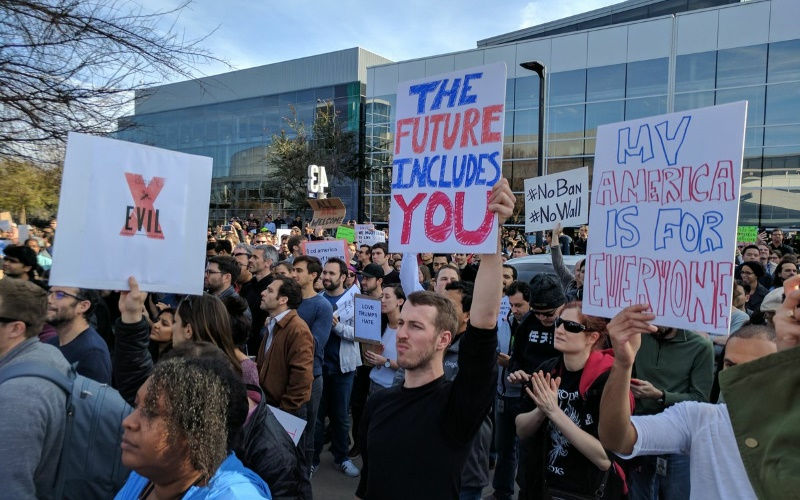 Really the Hypocrisy of Silicon Valley companies such as Google is so exposed by this incident. That is it is breath taking. SO as the author noted, how in GODs name these Silicon Valley Wall Street based companies are upset by Trump Travel Ban when this Ban as vile as it is has not Killed any American People but Republicans AND Democrats opposition to Government run Universal Socialized Healthcare, that EVERY Developed Nation has, and has had for many Decades, is Killing 10s of 1000s of American Per Year! HOW? I tell you one of these Days the Wall of lies is going to Crash on the head of Wall Street Mafia that has lied so much and continues to lie to American People. When is the question. Why should staff of "Silicon Valley (oh so cool Wall Street based) companies such as Google, Twitter, Facebook, etc. " care that American people do not have Healthcare? That is not their Job. 1st, they should care because 100-Million American People who do not have Healthcare are their fellow Citizens and should they catch an infectious disease then these people without Healthcare will have their infectious disease get much worse and pass it to 1000s More. However where we to have NHS like other developed Nations, then this infectious disease would be treated at early stage at much lower cost. 2nd, the point is that these Silicon Valley (oh so cool Wall Street based) companies such as Google, Twitter, Facebook, etc. demonstrating against Trump Travel Ban is a Hypocrisy given the fact that as horrible as this Ban is it has not Killed anyone whereas lack of NHS is killing 50,000 Americans per Year. Reporter man, you have nailed it again with this Article. Thank you so much for standing for Truth. 1st, What the Hek happened to USA to have a Hate Monger such as Trump as President. 2nd, I am so glad that you have exposed the fact that Google, Facebook, etc. are part of the same Wall Street Machinery that is behind so much misery World Wide, starting in USA by opposing even Universal Health for American People, what we here in Europe consider to be a right of every citizen. And look at what a mess Europe is. Its cities are almost bankrupt due to your Welfare state.